Support the Big Denim Drive at Regency Square, and help local Henrico County Public Schools win cash prizes. Goodwill of Central and Coastal Virginia will host its third annual Big Denim Drive for Henrico County Public Schools. This event enables residents of Henrico County and Goodwill to turn jeans into jobs while raising funds for Henrico County Public Schools. During the Big Denim Drive, schools compete to collect used jeans and other denim items. Goodwill, a 501(C)3 non-profit organization, sells the denim at its retail stores, and proceeds support Goodwill’s various job training and career development programs for individuals in our local area. These programs serve more than 17,000 job-seekers annually in the Greater Richmond community. The drive also raises awareness of the greening of blue jeans that are recycled and repurposed for a good cause, and it gives local public schools the ability to win cash prizes for discretionary needs. The educational value is enhanced this year as this recycle/reuse event will be occurring during Earth Day 2018. Denim not sold in Goodwill stores is processed by textile recyclers. Goodwill of Central and Coastal Virginia partnered with Chesterfield Town Center and Chesterfield County Public Schools for the first Big Denim Drive in 2008. At that time, Chesterfield Town Center served as a sponsor, a denim collection site, and was the venue for an awards ceremony at the end of the drive. In the Fall of 2018, this event will enter its 10th season. In spring 2016 Goodwill expanded the Big Denim Drive to include Henrico County Public Schools at Regency Square. The Big Denim Drive yielded approximately 10,000 pairs of jeans. Goodwill plans to build on that momentum for future events. 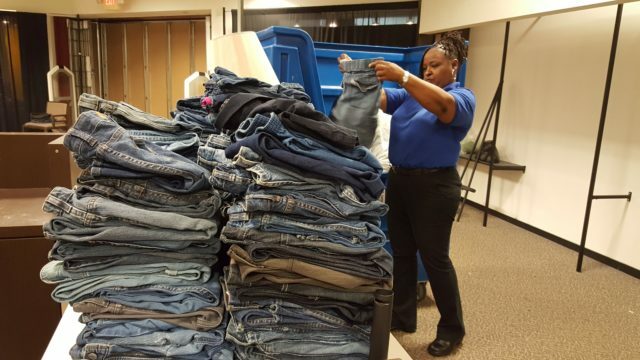 The Big Denim Drive is for all public elementary, middle, and high schools in Henrico County. All Henrico County Public Schools have the opportunity to participate, though the level of competitiveness can vary from school to school. Students, parents, and school organizations are encouraged to collect denim items. These items are then take to Regency Square during a specified event period where volunteers are available and will be keeping a running tally. When dropping off, the donor informs those at the information center which school the jeans should benefit. At the conclusion of the second weekend, the principals of winning schools are notified and invited to the awards ceremony. The awards ceremony recognizes the top three elementary, middle and high schools for a total of 9 cash prizes. The prize levels are $1,000, $750, and $500. In addition, weekend bonus awards of $250 recognize the top donating school for the week for each weekend. Checks are distributed to the school principals and can be used at their discretion. This year we will also award a rotating annual Grand Champion trophy.